Sweet Corn Tamales with a Savory Filling - Authentic Mexican Food. Chanchamitos is the common name for Sweet Corn Tamales stuffed with pork in Chipotle sauce. The process to make them is similar to making the famous Uchepos from the State of Michoacán but without the filling. These Savory/Sweet Corn Tamales are from the southern region of the state of Veracruz. I found out about them while living in the city of Coatzacoalcos, a coastal town famous for its oil refineries, as well as for being the hometown of the famous Mexican actress Salma Hayek. My husband and I were newlyweds when we arrived to live in Coatzacoalcos back in the 80’s. We both had jobs, and sometimes we liked to go out for dinner after a long day at work. One Friday evening, we discovered a lady sitting outside the municipal market with two large metal buckets covered with cloth napkins and plastic. We asked her: “what are you selling?”, to which she answered “Chanchamitos”. My husband and I had never heard of them. She then explained that they were tamales made with fresh corn and stuffed with pork in a chipotle salsa. “You can try one”, she said. “If you like it, you pay for it, and if not, that’s fine with me”. We loved them, of course, and as a matter of fact, these have been my husband’s favorite tamales ever since! To make them, it’s best to use fresh corn, but frozen corn works too, just make sure to drain the corn very well. Remember that Mexican corn is not as sweet and juicy compared to the corn you find here in the States. This recipe is my adaptation using the ingredients available here in the USA and is based on my knowledge and the help of one of my friends in the State of Veracruz, Chef Arodi Orea. Place the contents of the saucepan in your blender and process until you have a smooth sauce. Set aside. FOR THE DOUGH: Detach the husk from the cobs and place in a large pot with hot water to soften (see notes). Remove the kernels from the cob with a sharp knife, then place them in your blender or food processor. Process until they’ve been around, but still have some texture. Pour into a large bowl. Stir in the softened lard (or butter) and mix well. Add the masa-harina little by little as needed. Depending on how watery your dough is, you will need to add or reduce the amount of masa-harina. Mix the dough until it looks like a smooth and thick cake batter. Season with salt and sugar. The amount of sugar and salt will depend on the corn flavor, and your taste. Sometimes, the corn is too sweet and other times they are just plain in taste. Remember that some of this seasoning gets lost when you are steaming the tamales. ASSEMBLING THE TAMALES: Remove the husks from their warm bath and drain well. Place the smallest husks at the bottom of your steamer. Place two husks together, with the wide sides facing each other and slightly overlapping (if the husks are too small, you can place more than two together). Spread 1/3 cup of the corn masa dough and add 3 – 4 small cubes of the raw pork meat, then top with 3 tablespoons of the sauce. Finally, place an epazote leaf (if using) on top of the salsa. Fold the sides of the husk to the center and then do the same with the narrow edges of the husks. To tie the tamales, do so in the same way as if you were tying a package. TO COOK THE TAMALES: Place the steaming rack in your pot, add 2 cups of hot water, and cover the steaming rack with the small husks. Place the tamales in the pot, arranging them in a vertical position. You can also place them in a horizontal position like I did in the pictures (my pot is too small to hold them vertically). Cover the tamales with extra corn husks and then place the lid on the pot. Cook for 1 hour and 20 minutes. Check the pot during the cooking time to see if you need to add more hot water. 16 Epazote leaves if you find them in your area. Place the cleaned peppers and tomatoes in a saucepan and cover with water. Cook for about 15 minutes over medium heat until they’re soft. Detach the husk from the cobs and place in a large pot with hot water to soften (see notes). Remove the kernels from the cob with a sharp knife, then place them in your blender or food processor. Process until they’ve been around, but still have some texture. Pour in a large bowl. Remove the husks from their warm bath and drain well. Place the smallest husks at the bottom of your steamer. Place the steaming rack in your pot, add 2 cups of hot water, and cover the steaming rack with the small husks. Place the tamales in the pot, arranging them in a vertical position. You can also place them in a horizontal position like I did in the pictures (my pot is too small to hold them vertically). Cover the tamales with extra corn husks and then place the lid on the pot. Cook for 1 hour and 20 minutes. Check the pot during the cooking time to see if you need to add more hot water. One chipotle pepper won’t render a spicy sauce. If you like spicy, you can add two or more peppers. Not everyone can find lard in their area, but butter works very well for these types of tamales. I hope you enjoy these Sweet Corn Tamales and its delicious pork with chipotle filling. Can Crisco be substituted for the lard? great recipe looks like my mom’s I look forward to making yours, the image makes me want to do it tonight. I absolutely adore your site. When i am looking for mexican recipes. 2 questions please, first can I use beef brisket instead of pork in this recipe? And second are you using plain masa harina the kind for tortillas instead of the masa for tamales? Thank you so much! All your recipes are fabulous, can’t wait to try these! 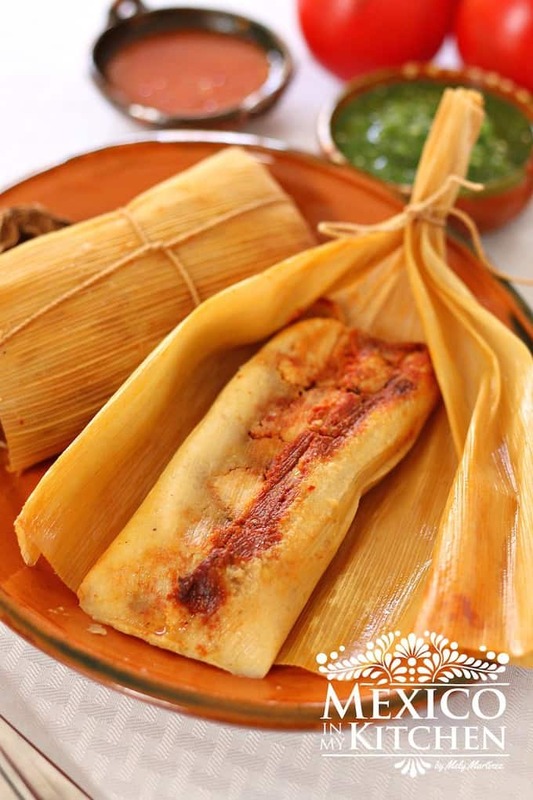 You can use beef or chicken, although pork and chicken are the traditional fillings for these tamales. You can use either one tamales or tortilla masa harina. You only will use it to give the dough the consistency needed to make the tamales. Enjoy! Hi, we love your recipes! We are currently stationed overseas in Sicily and cannot find Epazote leaves, or at least I have not seen them. What is a good substitute and how much should I use? You can just skip the Epazote leaves. If you don’t find them there. You tamales will still be great. If you want to add another herb cilantro is a good option, different taste but still a great addition. Thank you for this recipe, and for your blog! The tamales were delicious, and I appreciate so much how all you convey a “you-can-do-it” attitude. I was just wondering, can I freeze the batter I have leftover? Do I use fresh or dry Ancho peppers? Or do I roast a poblano? Fresh or dry guajillo peppers? Fresh or dried epazote leaves? You sue dried Ancho Peppers, you roast the peppers. You can use either fresh or dried epazote.